Our industry leading Flight Dispatcher Generic training text provides everything necessary to prepare for the TC generic exams and no external references will be needed. All mandatory subjects along with detailed examples and explanations of all complex calculations have been provided. The user is thus able to focus on the required content and can quickly learn the required subjects and problem solving techniques without having to "re-invent the wheel" by sourcing and researching dozens of obscure and hard-to-find secondary references. Our course text also includes a detailed index, along with subject cross referencing to all Transport Canada subject codes as found in the current Transport Canada Flight Dispatcher Study and Reference Guide. Loaded with illustrations inclusive of tables, charts, diagrams and performance data. This course is perfect for independent home study. Users of this course should be able to easily prepare for the Flight Dispatcher generic writtens with 4 - 6 weeks of dedicated study. While those having some background in aviation such as holding a Private Pilot Licence or higher, or having worked as an air traffic controller, flight navigator, flight engineer, weather briefer or meteorologist will have an advantage towards learning the flight dispatcher subject matter, it is still perfectly acceptable for a non-pilot to self study for these exams with no previous aviation experience, and any person at least 21 years of age that can understand either English or French can sit the flight dispatcher exams. A career as a flight dispatcher is challenging, interesting and rewarding and the pay is excellent. 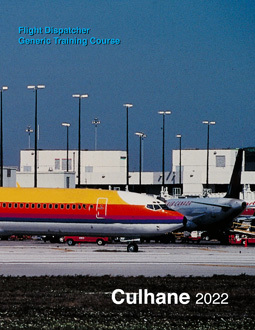 In the interests of maximizing exam performance it is recommended that users of this course text also obtain as a supplemental text our Flight Dispatcher Written Test Book, which includes 12 supplemental Flight Dispatcher Generic exams (6 FDMET and 6 FDOPS), that are cross referenced to our Ground Training Course. Completing the written tests in our written test book will greatly improve exam performance. 346 pages, perfect bound. ISBN 978-1-895801-58-3. NOTE: In addition to our texts, those preparing for the Flight Dispatcher writtens will also need a flight computer: for greater accuracy and "ease of use" for completing the required calculations, we highly recommend the CX-3 electronic flight computer by ASA (a standard E6B or circular type flight computer will also suffice, however, E6B's are slower and more complex to use, are less accurate and lack the data input "prompt" feature provided by the CX-3).